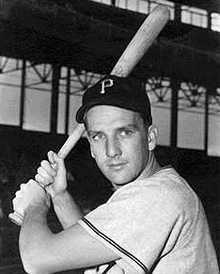 Ralph M Kiner was born in Santa Rita, New Mexico on October 27, 1922. Kiner's father died when Ralph was young and his mother moved to California. He played baseball at Alhambra High School and was signed by the Pittsburgh Pirates immediately after graduating. His professional career began in 1941 as an outfielder with the Albany Senators in the Class A Eastern League. In two seasons with the Senators he batted .288 and .268. In 1942 his 14 homers led the league. Kiner joined the Toronto Maple Leafs of the International League in 1943, but within a few weeks he was inducted in the Navy. As a cadet he attended St Mary's Pre-Flight School in California and earned his pilot's wings and commission at Corpus Christi in December 1944. 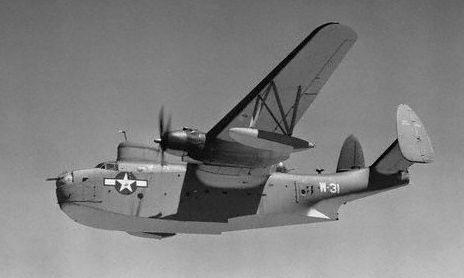 He flew Martin PBM Mariners from Kaneohe Bay Naval Air Station in Hawaii on submarine patrols, accumulating 1,200 flying hours and playing hardly any baseball during that time. He retired after the 1955 season and became general-manager of the San Diego Padres in the Pacific Coast League - a position he held until 1960 when he launched a career as a baseball broadcaster with the White Sox and then the Mets.